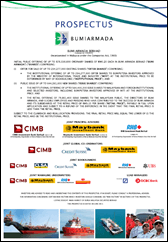 Bumi Armada Berhad IPO institutional and retail price fixed at RM3.03 per share today. As such, the final retail price will be adjusted to RM3.03 per share to match with the institutional price, reduced from its initial indicative price offered in its IPO prospectus. The difference of RM0.12 per share will be refunded to successful applicants within 10 market days from the final balloting. The refund cheques will be sent out by normal post mail to addresses stated in the application forms or CDS records. Under its public issue, 21.3 million shares made available to Bumi Armada employees and associates, and the other 58.6 million shares made available to the Malaysian public for subscription. For the 58.6 million shares made available for public subscription, a total of 614 million applications shares were received from the Malaysian public. This represents an overall oversubscription rate of 9.50 times. Half of the Malaysian public portion or 29.3 million shares set aside for Bumiputera category was oversubscribed by 5.19 times with 181 million shares applications received under Bumiputera category. Another 50% or 29.3 million shares for non-bumiputera public category has been oversubscribed by 13.80 times with 433 million shares applications received under this non-bumiputera public category. Notices of allotment will be dispatched by post to all successful applicants on or before 20 July 2011. Congratulations to those investors who were successful in the balloting. Wish you a good fortune and big windfall at the listing day on 21 July 2011, Thursday.